Whether casual camper, occasional outdoorsman or die-hard survivalist, shopping for a sleeping bag can be a daunting experience — but it needn’t be. From the best sleeping bag for children to the most lightweight sleeping bag for on-foot expeditions, we’ve put together a list of sure-fire winners, each with its own unique set of offerings. Each bag on our list is given a comfort rating, which tells you the temperature down to which you’re likely to get a snug night’s sleep, and an extreme rating (think more along the lines of Luke Skywalker’s Tauntaun survival bag in The Empire Strikes Back) to let you know how much cold your bag can withstand. The season number tells you how often the bag can reasonably be used throughout the year, with the maximum of 4 being the most versatile, and 1 being the least. Finally, when it comes to the question of which sleeping bag filling is best, it’s all about pros and cons: synthetic fillings are cheaper, easier to clean, and dry more quickly if you get caught in a downpour, so consider keeping one in the cupboard for impromptu camping trips. 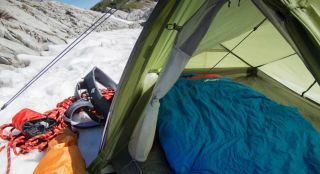 Down fillings, meanwhile, are warmer, easier to compress, and have a longer lifespan, making them a good investment for more frequent campers, climbers and other assorted adventures. Once you have made your choice, don't forget to arm yourself with a comfy camping air bed to guarantee a great nights sleep. Kompakt by name, kompakt by nature: this Mammut model takes the top spot on our list for a number of reasons, but its big selling point is its ease of use. The compression straps mean it packs down small for easy carry, and its smooth zips don’t snag, nor do they leak any noticeable amount of heat, thanks to an internal draught excluder along their length. The secret to the Vango Ultralite’s success is its light-as-a-feather Polair Active nylon construction, a multi-tasking material that lets this bag resist water and wear, and roll down to a respectable size. Unfortunately its lightweight nature is a double-edged sword — it doesn’t perform at its very best in below-freezing temperatures, but it’s a great warmer-weather bag nonetheless, and one that won’t weigh you down on your travels. At just shy of £60, the Highlander Phantom is hands-down the best value entry on our list. Despite being a good deal cheaper than most high-performing bags, it’s impressively resilient, made from tough-as-nails non-rip nylon, and said to keep you going down to a teeth-chattering -33 degrees (although we must say, we haven’t experienced these temperatures ourselves, so exercise caution even if you do fancy yourself a bit of a Ray Mears). The Vango Fuse’s unique blend of synthetic and humanely sourced duck down, plus the way it’s distributed around the body of the bag, gives great results in the field. Box wall construction keeps the down in line, meaning no cold spots or lumpy bits, and the fact that it’s treated means it stays dry up to four times longer than its untreated equivalent. Plus, the 3D hood with multi-cord closure keeps things snug. All in all, a very clever little bag. Glastonbury-goers, glampers, and those who just like a few home comforts on the road: look no further. The most comfortable sleeping bag on our list, it’s also stands up surprisingly well to cold, keeping its cool down to a chilly -20 degrees. The foot-level ventilation is a really nice touch for those who overheat in the night, the poly-cotton inner has a distinctly duvet-esque feel to it, and the built-in pillow takes the pain out of sleeping away. A sure-fire recipe for happy campers, if we ever saw one. A sleeping bag that feels as luxurious as the Rab Ascent might not seem as if it would be able to withstand much bad weather, but for all its high-end features — duck down filling and soft-touch lining, comfortable internal collar and snug drawcord hood — it’s deceptively tough. Those fabulous feathers loft impressively with a good shake, and then keep you toasty for a good night’s sleep. A sleeping bag made for two is just the ticket for impossibly romantic adventures in the great outdoors. An anti-snag, easy-glide zip system minimises the risk of disturbing your sleeping partner on early rises and night-time trips to the loo, and the inside pocket for hoarding little essentials keeps the right stuff close at hand. Doubling up isn’t just for couples though: if you’re a solo traveller who just appreciates the extra space, we highly recommend treating yourself. Go on, be a devil. This lightweight double construction sleeping bag ticks all the boxes for spring and summer expeditions. Its extra wide egg shape strikes just the right balance between roomy and snug, and its ergonomically designed SMOOZIP system means less fiddling and faffing when it comes to getting up. For those of a chilly disposition, it boasts extra fill in the chest, head and foot zones, keeping you warm where it counts. The Snugpak Navigator might not be the most resilient on our list, but its pocket-friendly price and pack-friendly size make it a winner. An especially good buy for DoE or Scout and Guide camps, it offers a good amount of warmth for not much investment — so if they never want to set foot in a campground again, it’s not the end of the world — and its compression straps mean it’ll fit neatly onto most camping bags.